Your Last Will & Testament is your statement of how you want your estate to be distributed after your death. According to the American Bar Association, "A statutory will is a form that has been created by a state statute." These laws vary from state to state and according to judicial jurisdictions. With some preparation, you can usually write a Last Will and Testament for free. 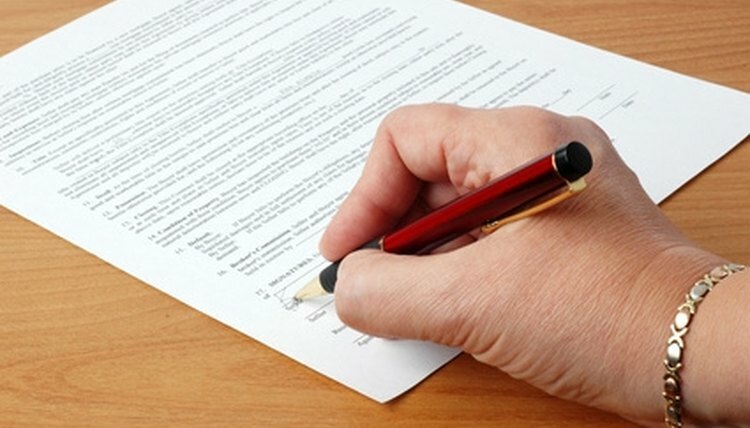 Check your state's laws about writing a will. A state's Department of Aging or similar agency website generally has sample documents. There may be a specific format or specific guidelines about filing and executing your will. Create a title for the legal document. Your title will describe the document; for example, "The Last Will and Testament of (fill in your full name, including any aliases)." Your first paragraph should include your awareness of who you are and your mental state of mind. For example, "I (name), of (physical and mailing address, city, state, and zip code), being of sound mind and body, hereby declare this to be my Last Will and Testament." Your next paragraph should affirm this to be your most recent and operative will. For example, "I hereby revoke all previous wills." This statement voids any wills that you have previously written. The next paragraph should include your beneficiaries. If they are your immediate relatives, such as your spouse and your children, you should clearly list your spouse by name and declare that you will subsequently refer to this person as "spouse." In your next paragraph, you would need to state how many children you have. If you have children, you must state them by name(s). If these beneficiaries are minors, you should name caregivers or guardian(s) for them. In your next paragraph, you must assign an executor for your will. This will be the person who administers your wishes. Your next paragraph will state how you wish this person to manage your affairs, such as financial obligations, medical expenses and funeral costs. Next, you bequeath your belongings. For example, "I would like to leave my comic book collection to my friend Tracy." Continue this process until you have accounted for all of your important possessions. If you are married, you may want to end with a statement that you wish to "give the rest and residue to my spouse," and include your spouse's name. You may also want to name an alternative person as your beneficiary, for example if your spouse has already died. Finally, you must sign and date your will in the presence of two witnesses. These witnesses should be impartial and not affected by your will in any manner. A notary public would be a wise choice for a witness. Robinson, Tracy. "How to Write a Free Last Will & Testament." , https://legalbeagle.com/6575285-write-last-testament.html. Accessed 25 April 2019.